I'll take a punt and guess that for most of us older painters out there we have a lot of different branded paints in our collection. And out of all of them there would be a sizable amount from Citadel? I'm just guessing obviously, but that's how it is for me. Now, out of all of those paints that I've ever owned there's only ever been a couple that I treasure, can't do without, reach for on just about every occasion that I paint. One of them is Devlan Mud and the other was Gryphonne Sepia. 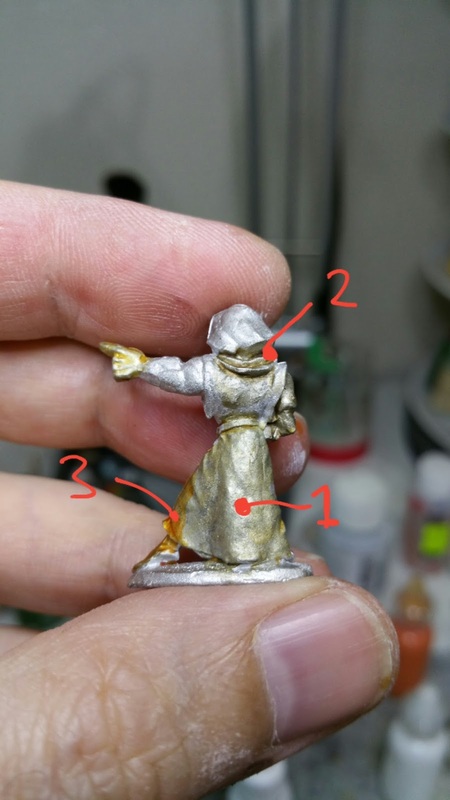 The former was great at dirtying up minis, the latter was excellent at making silver look like gold. But as time went by and I used up the last of my Devlan mud I went looking for a replacement, which I found with AP Dark Tone. But when my pot of Gryphonne Sepia ran out late last year, and I discovered that GW had discontinued it, I couldn't find a good enough replacement from any another company. So that got me thinking, how hard would it be to make my own? After a quick look around online I came across an old recipe for it on a forum. It called for a few different ingredients, most of which I had, but the results weren't that convincing. So I decided to try to make it myself with what I had on hand. I grabbed some Windsor & Newton Burnt Sienna & Liquitex Matte medium and started playing around with ratios. 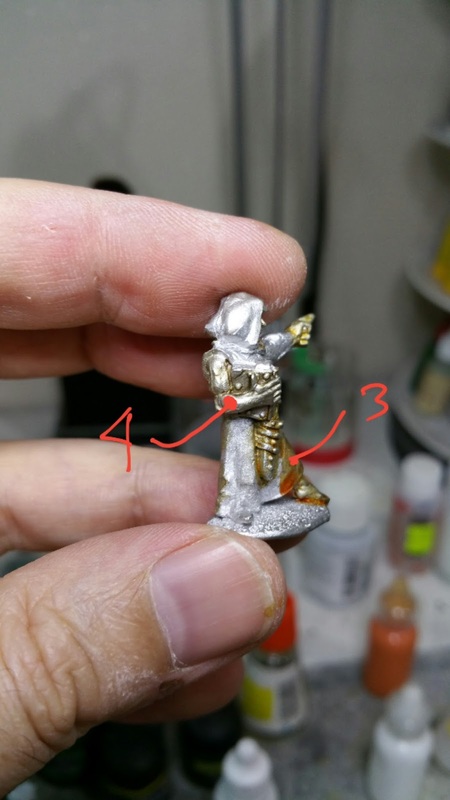 For me, I found the best results when I mixed the two 1:1. Here's some pics, just coz. 1. Is the Sepia ink with a pretty strong dilution of water and matte medium. As you can see it's pretty weak, but that's only after one application, more layers should yield better results. 2. Is the AP Soft Tone with matte medium 50/50. What can I say, it's brown. Fail. 3. Is the Sepia and matte medium 50/50. I reckon this one is pretty damn close. I was sloppy laying it on, but with more care I think it's a win. 4. Is the straight AP Soft Tone. I'll be using that as just a brown ink from now on. And here's a proper test on a painted mini. 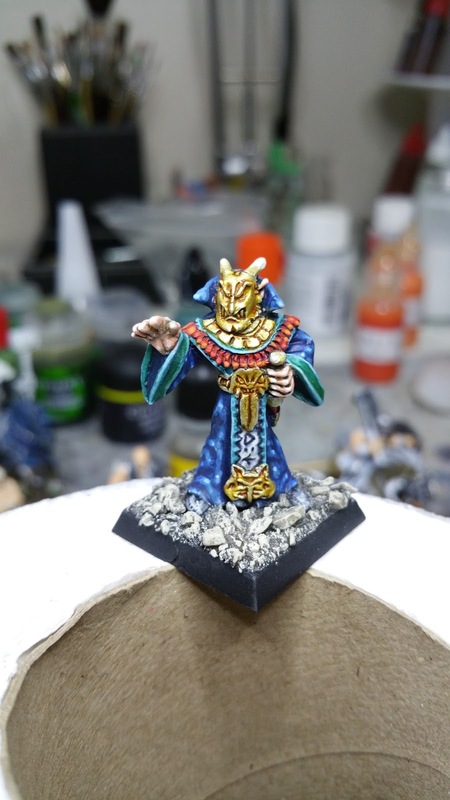 I'd painted this guy on the left a few months ago, but I wasn't sold on the gold effect for his mask and necklace. I can't quite remember what I used now, but whatever it was it wasn't very gold looking to me. I pulled him out of my display case and hit him with a coat of my new wash. The results are on the right, obviously. So, what do you think? Does it work? Is it close enough to the old Gryphonne Sepia? I'd be interested to read your thoughts in the comments. Oh, and I bet some of you may be wondering why I just didn't try and buy some second hand pots of Gryphonne Sepia on Ebay. Well, I tried for quite a while, but with no luck. The sellers either wanted way too much for it or there just wasn't any for sale. But last week I had look and found a few. So I don't need to use this recipe for a while:) It's still nice to know that I can make it in the future though, when there;s no Gryphonne Sepia out in the wild anymore. Glad you liked it Ranalcus. Looks good. 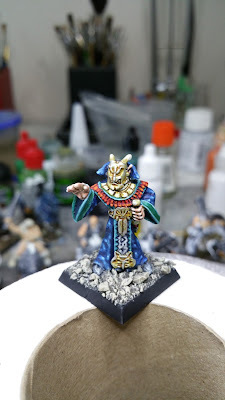 I make my ink washes from a recipe I found on line from Les Bursley on awesome paint job. His recipe uses matte medium thinned with water and flow aid then acrylic inks. 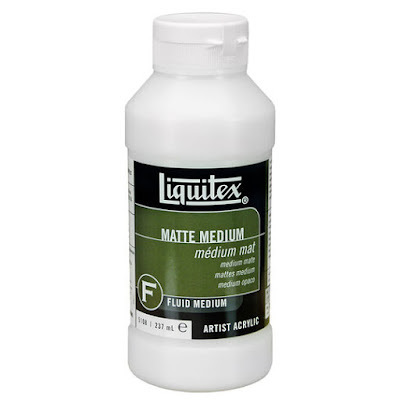 I use either Liquitex or Daler-Rowney. My grunge wash is a mix of Burnt Umber, Raw Umber and Black. Yeah, that recipe is the one in the link. It looks OK, but not really an exact replica of Gryphonne Sepia in my opinion. 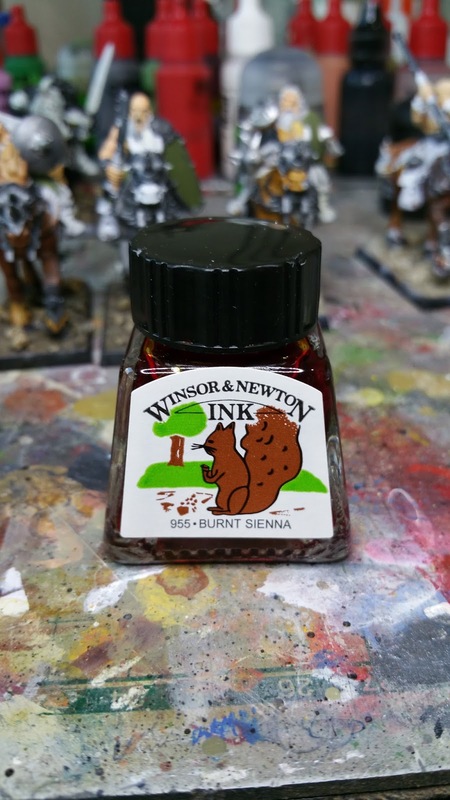 After reading this I quickly purchased the Burt sienna ink and followed your recipie. The result is very orangey, which is a great wash for gold. I tried to use it on skin but it’s too orange for that, imho. My fav ink wash is WN peat brown, above all others. I have been using it with excellent results for more than 25 years now. I suggest you try using it as a base not burnt sienna, which I find too reddish. Lately I started to use liquitex inks , the bottles with the dropper. Their burnt sienna is much more versatile than the WN one ( eg. It is great,watered down,for rust & stains. For the gold effect that I wanted the Burnt Siena was perfect. It really is as close to Gryphonne Sepia as I could have hoped for. I've also heard that the Liquitex inks are good as well. There's just too many manufacturers these days isn't there. We're spoilt for choice. I'll have a look at them when my other inks run low. be cautious with those washes as from my experience they are not colorfast and fade away when exposed to sunlight. To be on the safe side you have to protect them with an uv resistant varnish. I've heard that that's the case with them. I remember JB talking about that in a WD or something like that. 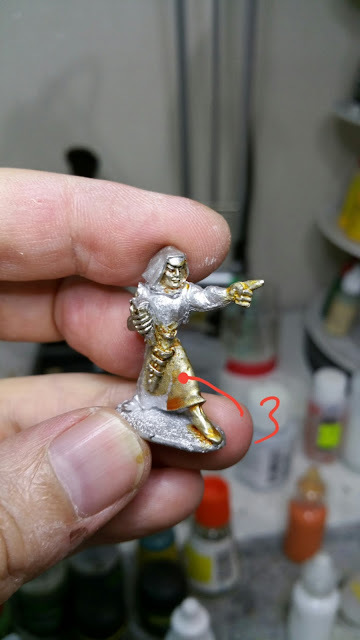 But honestly, I reckon that unless your playing with your minis in the garden your not going to notice any fading or yellowing. Remember, UV is direct sunlight exposure, not ambient light. Prime Beef in the 41st Millenium.